The ANT Blog: For the Birds! Sunset at Andante Game Farm - one of the views that all South Africans treasure! 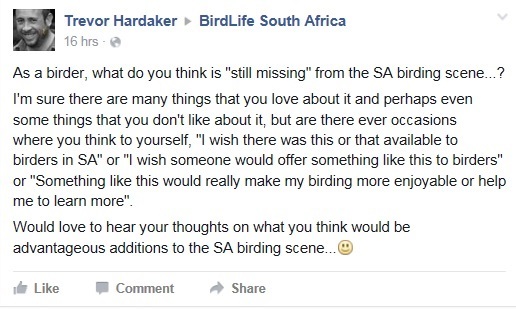 This morning, Trevor Hardaker posted a question on the Facebook page of BirdLife South Africa. Trevor is a well-known personality in birding circles. In 2007, he became only the second person ever to pass the magical 900 mark on his Southern African list, sharing this milestone with the legendary Ian Sinclair. 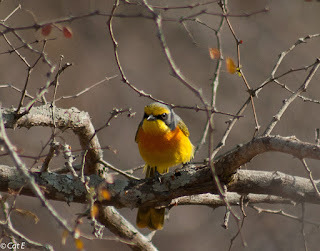 He currently serves as the chairman of the South African Rarities Committee. Throughout the day, this has received (and no doubt will continue to receive) a flurry of comments and 'likes' and replies from across the birding fraternity all over South Africa. As we begin to tangibly feel the onset of spring in Gauteng, Africa Nature Training is getting ready for a busy period of peak bird-watching...summer is coming! 1. 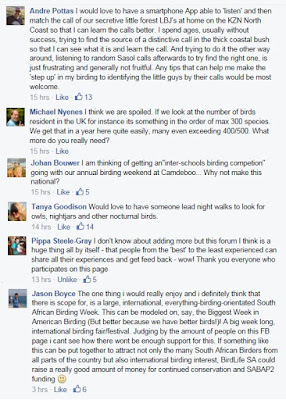 South Africans are interested in birds! 2. This interest takes various forms. The first point (which is also mentioned in one of the responses), is that South Africans are blessed to have such an abundance and variety of our feathered friends! Where else can you go to such an array of habitats and encounter hundreds of birds during the course of one day?! This is a highly rewarding hobby for anyone who takes an interest, no matter what the form. It could be that you feed the birds that visit your garden. Perhaps some of them are even nesting in your garden and you simply observe the process. It could be that you notice every bird you see as you take your dog for a walk around the park. It could be that you take binoculars and watch birds wherever you go on holiday. It could be that you spend every spare bit of time looking for more new species to add to your 'life list'. It could be that you participate in citizen science by regularly 'atlassing' and providing data for SABAP2. It could be that you actively support NGO's in their efforts to save bird species. It could even be that you hear about a rare vagrant and spend vast amounts of time and money dashing across local, regional or international boundaries to look for it. 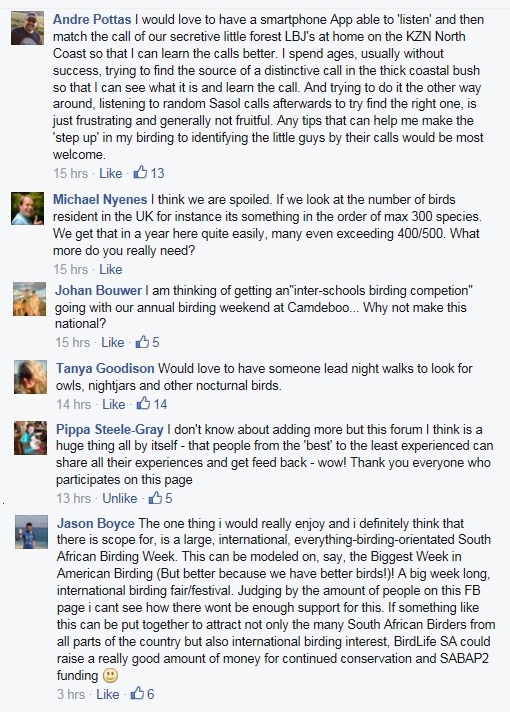 Whatever the form, we would like to encourage you to take an interest in birds! As well as being beautiful creatures in their own right, they have really interesting biology...if only people would take the time to notice. What better way to spend your time than to focus on something good and pure...rather than on the 'not so positive' things that bombard us every day in the media. If you would like to step into this wonderful world of birds but have no idea where to start, we are offering a part-time Savanna Bird Course to Gauteng residents that starts with an evening lecture on 4th November and ends with a weekend away to Nylsvley Nature Reserve on 29th November. Please contact our office for further details or to book your place: 012 667 5440 or info@AfricaNatureTraining.co.za.